Located in Pence Springs of Summers County. 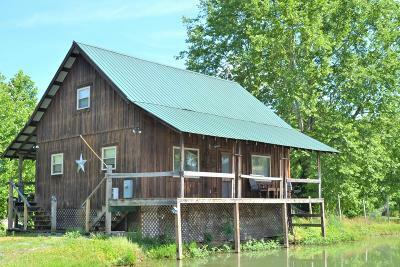 This 2 bedroom, 2 bath cabin is amazing! It's like living a vacation day everyday! Pretty exposed beams throughout main level. Gorgeous french doors leading into the main bedroom. There's even a spacious office/den upstairs for taking care of business or just lounging around. There's a fantastic view of a large pond that's right outside your front door plus views of the valley & distant mountains from the front porch. A great place to just relax & unwind from the day. Gently sloping lot offers plenty of room for a garden & pets. There's lots of local attractions nearby as well: Pence Springs Flea Market, the Greenbrier & New Rivers, Bluestone Dam, Sandstone Falls, Hinton Dairy Queen & my one of my favorite restaurants ... The Market!